It's no secret that tax dollars are in short supply in Illinois. But at a time when some lawmakers want to spend $100 million to lure a presidential museum to Chicago, while others are already drawing up hopeful plans for a George Lucas museum on the Lakefront, other projects -- such as the city's bridges -- have already been identified as needing more immediate attention. There are estimates that the repair tab for bridges in Illinois would now run a whopping $10 billion. And an examination of Illinois Department of Transportation inspection reports, shows that even Chicago's iconic drawbridges are in need of some rather expensive TLC. The LaSalle Street bridge has a "sufficiency rating" of just 22 out of a possible 100. To put that in perspective, the Wells Street bridge, which underwent a massive renovation last year, was rated at 19. Other Loop bridges run the gamut: Columbus Drive is rated at 83, but Kinzie is at just 33. Van Buren got a 33.7 rating, and it's undergoing $5 million in work right now. LaSalle's report card is not one to take home to mom and dad. The IDOT inspectors said the deck was in poor condition with advanced deterioration. The superstructure is rated as "serious" with significant section loss; the substructure "fair" with minor section loss and cracks. The report says the structural evaluation is "intolerable, a high priority for correction." And LaSalle is not the only one of Chicago's beloved spans in seeming need of attention. Lake and Kinzie also have "intolerable" structural evaluations. The substructures of Lake, Wabash, Washington, and Adams are listed as poor. The superstructures of Washington and Adams were listed as "poor" as well. The railings on 18 of the city's downtown bridges don't meet current design standards. And the river pilings around 16 of the bridges are listed as "deteriorated". "If they need attention we address it," says deputy transportation commissioner Dan Burke. "If something comes to our attention we address it immediately." Transportation Department spokesman Pete Scales argued the sufficiency ratings on the bridges don't give a true picture of their overall conditions. "Sufficiency rating is essentially an overall rating of a bridge based on over 20 factors," he said. "A low sufficiency rating does not directly correlate to the structural condition of the bridge. The structural condition of a bridge, as observed and evaluated by a qualified structural engineer is the main factor when determining whether a bridge should be programmed for repairs." Indeed, LaSalle has had some steel work done since the state inspection was performed. The city says the bridge, which is familiar as an iconic shot in many motion pictures, is currently being evaluated for a major reconstruction. Scales says Lake and Kinzie will get repairs by city crews later this year. And Adams is scheduled for work next year. Wabash and Washington are reportedly being evaluated, but no firm date for repairs has been set. Chicago is certainly not alone. There are 23,000 bridges in Illinois, and many need significant work. "We'd love nothing more than to fix all of them," says Andrew Keaschall, with the American Society of Civil Engineers. The organization puts out an infrastructure report card on the United States, and rated America's bridges a "C+". "Proactive maintenance can make sure small problems don't become large problems," Keaschall says. But he notes that the major source of funding for bridge repairs, the motor fuel tax, has not been raised since 1993. "I don't think anyone would be happy with not getting a raise in 21 years," he says. "The needs are increasing, the funds are decreasing. Really, something needs to be done about it." Indeed, one of the ironic aspects of the drive for greater fuel economy, is that Americans are using less gasoline. Not only has the motor fuel tax not kept up with inflation, but in some years, the revenues have actually dropped. And of course, some don't use gasoline at all. "The individual with the electric car has the benefit of not having to pay for his bridge," Keaschall observed. 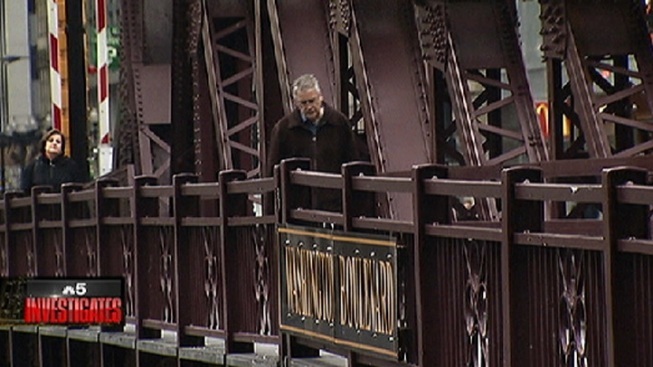 Watch Chicago's twice-weekly bridge lifts, and you're likely to be part of a crowd. High-masted boats make the trip up the river on Wednesdays and Saturdays, and many pedestrians stop to watch the giant spans lifted skyward. One of those bridge fans is retired engineer Jim Phillips. He loves Chicago's drawbridges, and maintains a tribute website, www.chicagoloopbridges.com, loaded with photos and trivia about the iconic structures. "Downtown here, we have bridges that range from a hundred years old, to 30 years old," he said. "It's a veritable bridge museum!" Phillips said he believes Chicago goes a good job of taking care of its drawbridges. Indeed, he says the fact that they move, and must be kept in good working order, probably requires them to get extra attention. And that, he says, is a good thing. "They're the heritage of Chicago," he says. "If we let 'em go, we will be much poorer for it!"